In the fall of 2017, Duke University’s on-campus Hult Prize competition was won by a team of students known as “mPower.” Their project is to use cold-storage technology – specifically, custom-made, modular, solar-powered refrigeration units – to access rural farmers in India and transport their produce straight to retail. The result is a win-win-win: fresh produce for consumers, no food waste, and empowered small businesses. 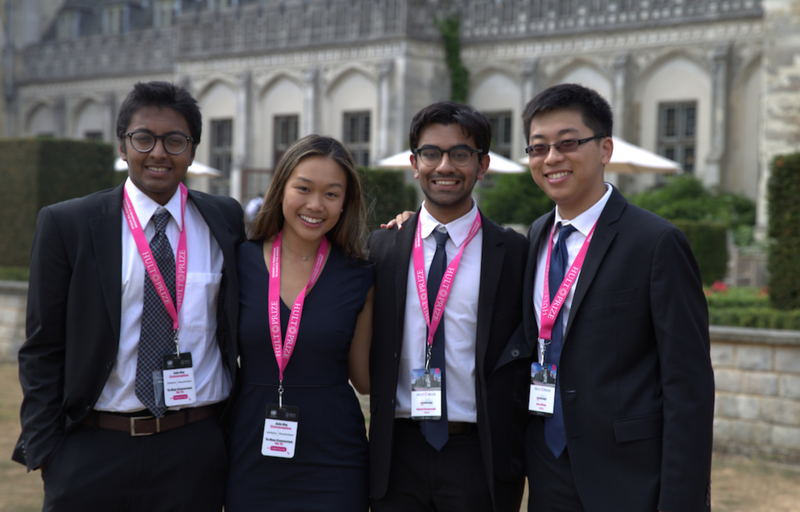 Team mPower (l to r): Harshvardhan Sanghi, Sherry Feng, Saheel Chodavadia, and Jason Wang. Team mPower’s victory at Duke led them to the Hult Prize regionals in Mexico City in early March of 2018, which they also won. Now, they’ve advanced to the finals, a Hult Prize competition that is preceded by a six-week start-up accelerator MBA course in England. Following the Accelerator Program, six teams will be selected to pitch their ideas at the Hult Prize Global Finals hosted at the United Nations in New York. The winning teams will receive $1 million in seed money for their project. With this additional research behind them, Team mPower arrived in England for the Hult Prize Accelerator Program on July 23rd, alongside 41 other winning teams from around the globe. They will be there until September 1st. All the finalist teams live in Ashridge House, a castle-type estate owned by the Hult family located about 45 minutes outside London. Although this may sound cushy, life at Ashridge House is intense. “On average, our team works, learns, and networks together for about 18 hours a day,” says Saheel. “We have to schedule in one hour of ‘break time’ every day so that we can relax and enjoy the castle and each other’s company away from our projects.” Do the math and you’ll realize that leaves only five hours a day for sleep. According to Saheel, the intensive nature of the Accelerator Program means that team members typically go to sleep around 3:00 or 4:00 AM and wake up around 7:00 or 8:00 AM every weekday. The Accelerator Program’s Monday through Wednesday schedule includes two three-hour “learning sessions” – one in the morning, one in the afternoon – with a variety of experts that might include university professors, CEOs of major companies, or experts in a specific industry. Team members are expected to network with and learn from these speakers during meals and in between sessions in order to enhance their projects. On Thursdays, the entire day is dedicated to “Office Hours” with the experts: it’s a day full of meetings designed give the teams direct feedback they can use to fine-tune their ideas. Finally, each week culminates with “Pitch Friday,” during which teams pitch their startup ideas to the experts who have spent time with them during that week. “The mentors now serve as judges,” explains Saheel. Teams in the Hult Prize finals represent countries including Greece, Japan, Malaysia, Laos, Iraq, Egypt, Tunisia, Jordan, Lebanon, along with many others. The 42 teams interact daily through planned cross-team activities and in their free time. Still, as with any high-stakes competition, there is pressure on the teams and their individual members as they vie for the same $1 million seed-money prize. “Each and every team here has dedicated themselves to their respective start-ups, and yet, they know that not receiving the $1 million does not mean the end of their journey,” says Saheel. “The skills we are learning here will translate into the real world, no matter what we do.” Now four weeks into the six-week Accelerator Program, mPower is at the stage of coordinating their first few sales in the Bangalore area of India. If you have an interest in or experience with produce distribution, supply chain, or branded produce, please connect with the mPower team at team@mpowerco.org.